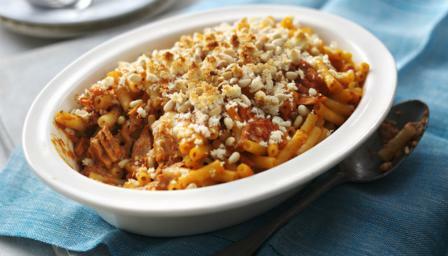 Tinned salmon makes this tasty pasta bake recipe economical as well as easy. Preheat the oven 190C/375F/Gas 5. Cook the pasta in plenty of boiling salted water as per instruction. Place the salmon into a bowl, removing any large bones. Tear the basil leaves and combine with the salmon. Add the passata, mascarpone and mozzarella. Drain the pasta and combine with the salmon mixture. Season well and place in an ovenproof dish. Top with dots of butter and sprinkle over breadcrumbs and pinenuts. Place in the oven to colour the top and heat through. Serve with some salad leaves dressed with olive oil, balsamic vingar and seasoning.